Trying to find the right gift for a bride can be difficult. You can spend hours searching for the right gifts with no success. But you don’t have to look any farther. Bridal gift boxes can be the perfect gift for a bride during her shower, at her bachelorette party or even just a few days before the wedding. 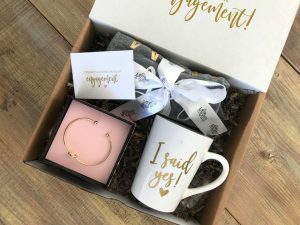 Why consider a bridal gift box? Here are just four of the many reasons! Instead of buying a couple of random gifts and putting them together, a gift box is already coordinated for you. For example, a travel-themed box includes everything the bride needs for her honeymoon travels. A box like this includes a luggage tag, sleeping mask, water bottle, and travel cosmetic bag. Matching and complementary, this box is perfect for the sophisticated bride that loves to travel. A gift box is an inclusive gift that can simply be purchased and given. You can save money when you don’t have to buy multiple items and save time by not having to make sure the coordinate and then wrapping them all up together. In one chic box, you can give the gift of travel, relaxation or self-care, it’s all in the gift box just waiting to be enjoyed by the bride. Nobody ever asks for a boring gift. Gift boxes are built to be fun as much as they are functional. Go in on a gift box with other friends or bridesmaids for a super fun gift box that can enhance a bachelorette pool party. This type of box includes a large pool float and cocktail-making kit. Giving this gift is the perfect way to kick off the weekend! Perhaps the best part of a gift box is that it can be very affordable. Whether you want to buy a gift box on your own or split the cost with a few other people, these boxes have options for every budget. For as little as $25, you can gift a bridal gift box! At that price, you don’t have to let the groom feel left out either. Grab one of the neck tie gift boxes for him! Your search for the perfect bridal gift boxes is officially over. Choose from one of many types of boxes that are the perfect match for the bride in your life. Bring a smile to her face and joy to her life when you gift one of these gift boxes.